What will 2017 bring for journalists? 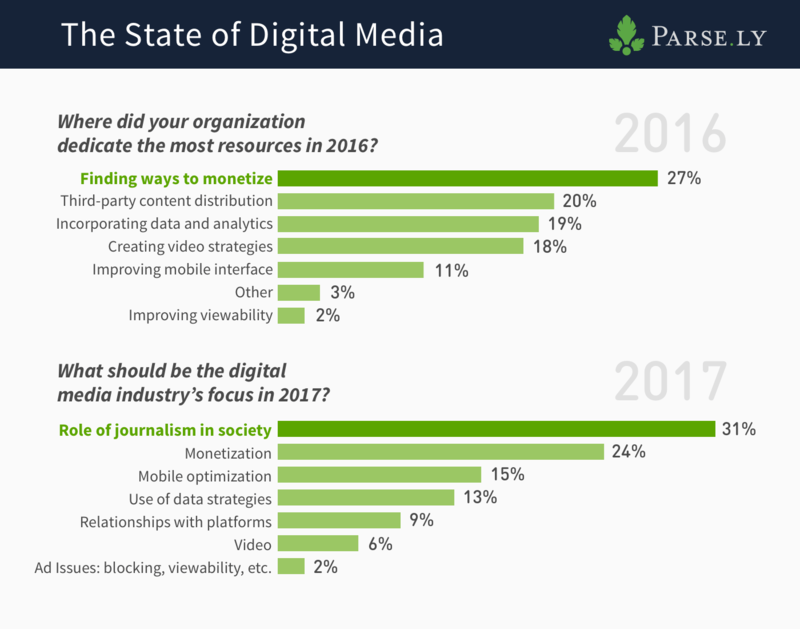 As part of a recent survey of more than 100 digital media professionals, Parse.ly found that this question is top-of-mind for digital media professionals, who believe that the role of journalism in society will be the digital media industry’s primary focus in the coming year. Sachin Kamdar, co-founder and CEO at Parse.ly, predicted this in a recent blog post supposing that journalists will begin more seriously considering how to best cover the news in 2017. And already, journalists are beginning to ask some important questions about the ways in which they approach reporting: How should we cover terrorism? How should we cover crime? How should we cover sexual assault? How should we cover a Donald Trump presidency? While the answers are still unclear, simply asking these questions is a good starting point. Their changing role is not the only thing that weighs heavy on journalists as we approach 2017. Take a look at the full results of Parse.ly’s two-question survey, below. 27 percent of digital media professionals said they dedicated most of their resources to finding ways to monetize in 2016. This corroborates the results from our 2015 survey, in which a majority of digital media professionals predicted that monetization would be their biggest challenge in the year ahead. 20 percent of this year’s respondents admitted to dedicating most of their resources to third-party content distribution — the same percentage of respondents that expected content distribution to be one of the biggest challenges of 2016 in last year’s survey. On the other hand, there has been some reprioritization of the main issues newsrooms are facing today. Nineteen percent of respondents to this year’s survey reported dedicating the most resources to incorporating data and analytics into their newsrooms in 2016. (Parse.ly saw the result of this, firsthand, via a growing list of customers who are using our analytics tool to help determine what content resonates best with readers.) However, only 13 percent of respondents said that use of data strategies would be a focus in 2017. Eighteen percent of respondents reported dedicating the most resources to creating video strategies in 2016, but only six percent said it should be a focus in 2017. One reason for this could be because newsrooms have not seen immediate results from their fledgling video experiments. Fourteen percent of respondents to last year’s survey predicted that mobile optimization would be one of the biggest challenges for the media industry in 2016. Only 11 percent dedicated the most resources to improving their mobile interface this year, yet 15 percent feel that mobile optimization should be the digital media industry’s focus in 2017. Could this mean that mobile is becoming more important for digital publishers? Beyond a preoccupation with journalism’s role in society, media companies are still concerned about monetization in 2017, according to 24 percent of respondents. However, surprisingly low on the online media industry’s list of priorities — especially compared to 2016 — are cultivating relationships with platforms (nine percent), video (six percent), and ad issues (two percent). Publishers realized they had no clear way to measure content on distributed platforms, and began to seriously consider the benefits of third-party content distribution. Many online media companies wrestled with finding the best ways to incorporate video into their content strategy last year. In fact, around 75 percent of respondents to a Reuters Institute survey said they only occasionally (or never) use video news online. Ad blocking became an expensive liability. According to a report by Juniper Research, ad blocking software could cost digital publishers more than $27 billion by 2020. Maybe online media companies feel they made some headway in dealing with these issues in 2016, or maybe they know that 2017 will bring with it some bigger fish to fry. What do you think? Are these results in line with your organization’s challenges in 2016 and focus for the year ahead?